Sekolah Cita Buana began 13 years ago with nine pupils in Bapak's former bedroom in his house in Wisma Subud, mostly catering to the children of Subud members living in the compound. Today it is a flourishing National Plus school with 350 pupils, ranging from preschool to the final year of high school, and with special attention to children with special needs. The idea for the school first arose when Hartati Horthy became involved in a non-Subud school which was occupying Bapak's house. 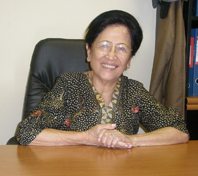 Ibu Ismana Haryono and other Subud members became trustees of the school and gained experience which gave them the idea of setting up their own school. As well as Ibu Ismana, the original trustees for Cita Buana included other Subud members such as the Geiger family. The wife of an Australian diplomat, with teacher training experience, helped to design a curriculum based on Australian standards combined with the Indonesian national curriculum. Ibu Ismana - President of Sekolah Cita Buana. The school got under way with grants and gifts from S Widjojo, Yayasan Muhammad Subuh, Simon Guerrand, the people directly involved in the school and other individuals. The school's name, given by Ibu Rahayu, can be understood to mean “global education” and the school's motto is “excellence and equality” and "bringing cultures together in bilingual harmony". Three years ago the school was able to obtain a large piece of land about 9 km from Wisma Subud. On this land it has built excellent facilities for both primary and secondary children in modern custom-built multi-storey buildings, one for the secondary school, and another for the primary school, and a building for children with special needs. There are also sporting facilities including a swimming pool. The school prides itself on integrating the Australian-based curriculum, with the Indonesian national curriculum, providing students with an innovative and dynamic experience. The curriculum is outcome-based and incorporates the worlds best practice teaching methodologies, promoting academic excellence, independence, and creative and analytical thinking. 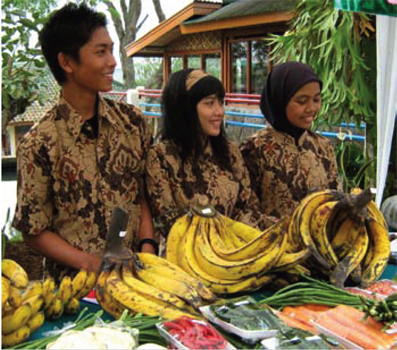 Delivered in both English and Indonesian, the program encourages students to become bilingual and bi-cultural, global citizens and lifelong learners. The teachers and students at the school come from all over the world and bring a richness of cultural diversity to the campus. This diversity brings richness of ideas, respect for others and ultimately develops a deeper appreciation of unity in diversity. The school's Special Education department accepts students with Autism Spectrum Disorder (ASD) and students with learning difficulties with an intellectual disability. Dedicated and skillful teaching staff educate students to achieve independence and to make a meaningful contribution to the community. 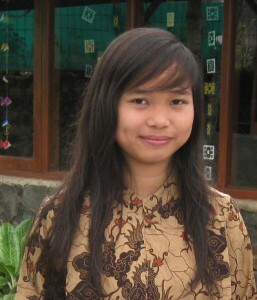 "I feel that the school is one big family,” says Ibu Ismana. “The principal of the school is a Subud member and we have a couple of other Subud teachers. But Subud is now becoming so normal in life and everyone, Subud u and non-Subud, works together well. At the same time, of course, we are guided by God. “We seem to have some quality that attracts and holds people. One of the non-Subud teachers said to me, 'I don't know why, but I just can't leave this school.' Knowledge of the school spreads by word-of-mouth. The parents are also very involved and supportive. For instance, contributions from the parents have enabled us to build a library. “Twice a year we send our teachers to Australia for further training. Our students have been extremely successful in getting into universities, not only in Indonesia, but also in Australia and the United States. Harris: In the last interview you told me about YUM’s projects in Aceh and Kalimantan. Could we backtrack now and talk about how YUM started and what projects you are doing in Java? Olvia: Well, actually YUM was set up legally in 1976. There was a priest, Father Wilbert Verheyen, who was doing some work with Sister Rina Ruigrok and Ibrohim Wesells, all from Holland. They were doing social work and then they became Subud members. So Bapak recommended the setting up of the Yayasan. Harris: So the seed of it was with these three people? Olvia: Yes, and Sharifin Gardiner was one of the Directors and Murray Clapham was Treasurer for a number of years. So it was a mixture of Indonesians and ex-pats living in Indonesia who set it up. And it was excellent for 10, 15 years. I have found in old records that, for example, in 1985, they had five clinics. They were serving almost 100,000 patients a year. They were assisting over 1,000 children with sponsorships. They were doing fantastic work. Harris: Would you just run through some of the projects that YUM has had over the years? There was a tuberculosis hospital, wasn’t there? Olvia: It was in Cipanas in hills a few hours drive from Jakarta which is still an area with very high tuberculosis. 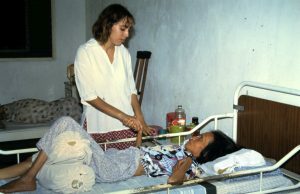 Indonesia is the place most affected by tuberculosis of anywhere in the world. So there was a clinic in Cipanas, where they were treating people but I had to close it because it had been operating without a license and without a doctor. They had no funding. So the only thing they had was Aspirin, Panadol, these kind of things. And it was no longer needed because there are now four or five different clinics there. YUM also started an orphanage in Cipanas know as The Children’s Village. What had been realized when the hospital was operating was that because not everybody survived, there were lots of orphan children. It remained an orphanage until last year, because now the Ministry of Social Affairs, UNICEF, and Save the Children are all saying that we should look after the children within their own families. A huge survey was done of 500 orphanages, and only 5% of the children had lost both parents. Maybe another 20% or 30% had lost one parent. But the big majority staying in those so-called orphanages were children who came from very poor families, who could not afford to feed all their children, nor put them through school. So we had a number of these over the years in the orphanage; they were the only ones who got an education in those families. So last year, because UNICEF and Save the Children and other big organizations were saying, “look after the children in their own homes”, we could not find funding anymore to keep 50 children. So we had to return the majority to their families after talking with each family and the children themselves. So we only have eight left who really could not be looked after by their family, and they have almost finished their studies, I mean they only have a few years left. But the others have been returned to their families and the government has given us funding to look after those children who have been returned. In fact, the funds are sent directly to the children; they have to open a special account, and the Health Ministry has lent us three social workers to visit the children regularly and make sure that everything is all right and to talk with relatives to make sure that the children are kept in school. Harris: And there was also vocational training, wasn’t there in Cipanas? Olvia: Yes. So we have now expanded our activities a lot in Cipanas. Instead of being an orphanage for only 50 children, our library is now open and we have 1,000 visitors a month, because all the kids from the neighbourhood come. They have nowhere else to go. So we have a playground. We also have a teacher coming every afternoon to help them with their homework. Those who want to can learn to play music and on Sundays they come to do aerobics. So cute! 50 little kids coming to do aerobics on Sunday morning. And then they help us clear up the grounds, in case there are papers or empty bottles. And then, as a reward, they get some milk. We get free milk from Nestlé. And we have also established a vocational training center, because like everywhere in Indonesia, it’s very difficult for young people to find work here. So when they finish high school or technical school, they need added skills in order to have a better chance to find a job. So we have a number of computer classes there. I think it’s 16 every month for different levels; same thing for English. We also have a job-seeking class and we work with the Hospitality and Tourism School to improve the English of some of their students; we prepare them for working in the world. 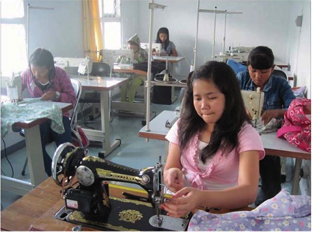 We also have a sewing class, and last year we established a sewing workshop to provide employment for local women, and now we have orders from the International School, JIS, to make 700 folders from recycled material. So we buy the recycled material from scavengers, and then we purchased special sewing machines, strong enough for these recycled materials. So the ladies are sewing these folders and making bags and other materials. And we have an organic farm there. Actually it was started three years ago. The idea being that since we had more and more difficulty to find funding for the orphanage, we should grow our own vegetables, but it was really only done on a very small scale for the first two years. It’s only early last year with the new project manager that things really started to develop. We had an excellent volunteer who helped us and it’s working very well. So we are invited every two weeks to sell our vegetables at the International School. They have a farmers market. So we sell these, and our bags and everything we produce, at the International School. So that is running very well. One thing I should mention is that we have a very good relationship with AUSAID, the Australian aid agency’s volunteer branches. So we get quite a number of Australian volunteers for one year or more and in general they are extremely helpful. So we apply for volunteers for specific activities. Next month we will get two for Cipanas; one to help us with the marketing of our organic produce, the other to help us develop the library into an information center. Another major problem here in Indonesia, is that the government has programs for poor people, but nobody knows how to access them. So since we have a good network and good relationships with the different government institutions in the area, what we plan to do is to put people in contact with these programs. They can learn what programs are available, and then we will put people in touch with these different institutions, so that they can access their programs. Harris: There was also a tuberculosis hospital in Pamulang, wasn’t there? Is that still there? Olvia: No. That was the land that we sold, two-and-a-half hectares which had lots of problems. Yeah, we had to sell it. There was no way to restart the projects there. They had been abandoned for 10 or 12 years. Harris: Are there any other projects that we haven’t talked about? Olvia: Yes, sponsorships. We also had two preschools in Jakarta. Again, these were not properly run at the time I became Chair. The staff could not be trusted. We did not own the premises; we were renting. So first I had to change the staff to people who could be trusted. And because we were renting we always had to find the funding for that and to pay the staff. And it is often the problem with donors that they don’t understand that we don’t only need equipment and buildings and furniture, but we need to cover our running costs such as staff. And if we can’t find funding for running costs, then the project cannot go on. And also those preschools were serving children of scavengers in the area. There were three scavenger locations in the area, but then in the huge Jakarta flood of 2008, the scavengers were displaced. The land they were using was totally flooded and the owners decided to get it back and build a supermarket. So they are no longer there and we are no longer in that area. And since we had so much difficulty funding running costs, we decided to close these preschools, but we continue to assist the children through sponsorships, to cover their education, as long as possible. What we hope is that once a sponsor starts sponsoring a child, that child will continue to be sponsored until he or she finishes her studies, because it’s useless to assist the child for one, two, three years and then not continue, because the child cannot get any work; you can’t do anything without proper education. Harris: So you try to support them through to the end of high school? Olvia: Yes, at least until the end of high school. There are a number of big companies nowadays that offer scholarships to university for poor families. So through the Muhammad Subuh Foundation (MSF),we also got some funding to help some young people go to university. We also hope that once the children we are sponsoring reach that age, we can help them to connect with these big companies. If they are bright enough to continue to university, then they have the possibility of doing that. Harris: You mentioned that there is currently a problem finding funding? Olvia: Yes, well, with all the problems in the world, such as the financial crisis in the developed countries, it’s more difficult to attract funding. Last week I was meeting with an Australian donor. He would like to establish a pre-school in Cipanas, because there is a need. There is no preschool for poor people in the area, and also because he himself has a lot of difficulty to attract funding. So he wants like a flagship project that he can show to potential donors, his friends, to show, OK, this is the kind of project our organization sponsors. Harris: Is funding from Subud members still significant? Olvia: Yes, it’s only a small proportion of the funding we need, but it’s still very helpful. But because we have grown quite a lot, our budget is in the range of $400,000 a year. So what we get through the various Subud organizations or individuals is maybe a fifth of that. Harris: So still very significant. Olvia: Yes, but that’s why we constantly need to look outside to companies and big organizations. Olvia: That is spread across all of the projects, but besides these 26 permanent staff, we have half-a-dozen part-time teachers for the vocational training centers, and we have part-time staff also here in Kalimantan working on various projects. And we have the Australian volunteers. Altogether we have 40 people working regularly here on our various projects, but it’s still not enough.